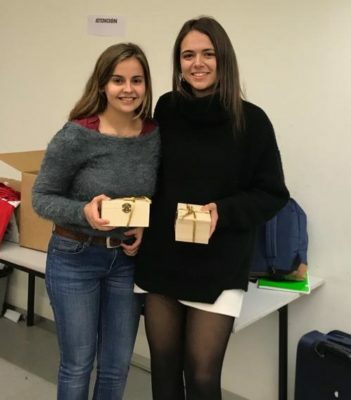 The team Fabregat’s Angels (Paula Villaseñor Cano, Carlota Delso González; Madrid) has won both the EFL and Grand final of the Barcelona Debating Open 2019! In the Grand final, they were victorious out of Opening Government, defeating the Opening Opposition Crazy Broke Asians (Kenneth Foo Wui Kit, Seyoung Jeon; KCL), Closing Government Abbas & Faizan (Abbas Azmat, Faizan Raja; Lahore) and Closing Opposition Ek Chutki sindoor (Arth Mishra, Ishaan Kapoor; LSE/Oxford). The debate on the motion “THP a world where the majority believed in determinism over one where the majority believed in free will” was judged by a panel of Louis Collier (chair), Gigi Gil, Ioannis Karellis, Jure Hederih and Vikki Perijainen. The EFL final was won by Fabregat’s Angels out of Closing Opposition against the teams URJC (Paula Alonso, Qquillaccori García) in Opening Government, Al-Quds 1 (Tala Salem, Dalia Alayassa) in Opening Opposition and Comillas A (Belén Montes García, Elena Gillis Cintrano) in Closing Government. The motion read “THBT mainstream Spanish political parties should operate cordon sanitaire policies towards radical populists (e.g. VOX) ” and included an infoslide. The adjudication panel consisted of Vikki Perijainen (chair) Daan Spackler, Duncan Crowe, Gigi Gil and Ioannis Karellis. Best speaker of the tournament was Ivan Veliantsei with an average of 80.00 speaker points. Best EFL speaker was Paula Villaseñor Cano with an average of 77.00 speaker points. Ana Vilhelmina Verdik, Daan Spackler, Darion Hotan, Ioannis Karellis, Jure Hederih, Louis Collier, Vikki Perijainen and Winta Mehari reached the judge break as well as the chief adjudicators Duncan Crowe, Gigi Gil and Muhammad Asadullah Khan. The tournament featured 32 teams and was organised by the Barcelona Debating Society. Acting as Chief Adjudicators were Carlota Noguerol, Duncan Crowe, Gigi Gil and Muhammad Asadullah Khan. Responsible for the tab was Pablo Molins, who also acted as Equity Officer together with Pablo Revilla-Álvarez. R1: THW make the number of votes an individual has inversely proportional to their wealth (i.e. the more wealth an individual has the fewer votes in an election). R2: THW grant senior military officers a veto over military decisions made by politicians (e.g. troop deployments, specific missions). R3: TH supports social movements having strict standards for what members should believe e.g feminists excluding pro-life feminists from the Women’s March. R4: THBT developing countries with substantial natural resources should nationalise natural resource production. R5: TH prefers secular governments that exclude all religion from public spaces to those that allow unlimited religious expression. SF: THBT that feminists should not use rhetoric about women being more empathetic or caring than men as part of their advocacy (e.g. “Women are good leaders because they are more compassionate”). THBT mainstream Spanish political parties should operate cordon sanitaire policies towards radical populists (e.g. VOX). F: TH prefers a world where the majority believed in determinism over one where the majority believed in free will.